With my new site design and re branding launch I wanted to share a couple of new features here on the blog and wanted to let you know about them! Here's a look at what's new and what you can expect to find around here. I have been wanting to share a post like this for some time. Bloggers take for granted that anyone knows how to navigate around a blog; let alone a post. I am guilty of believing the same thing until enough people who are NOT bloggers asked me something as simple as to where to locate an item I may be wearing in a post or how to sign up to receive the post in their email. So, today I am breaking down a blog post and hopefully answering all your questions. 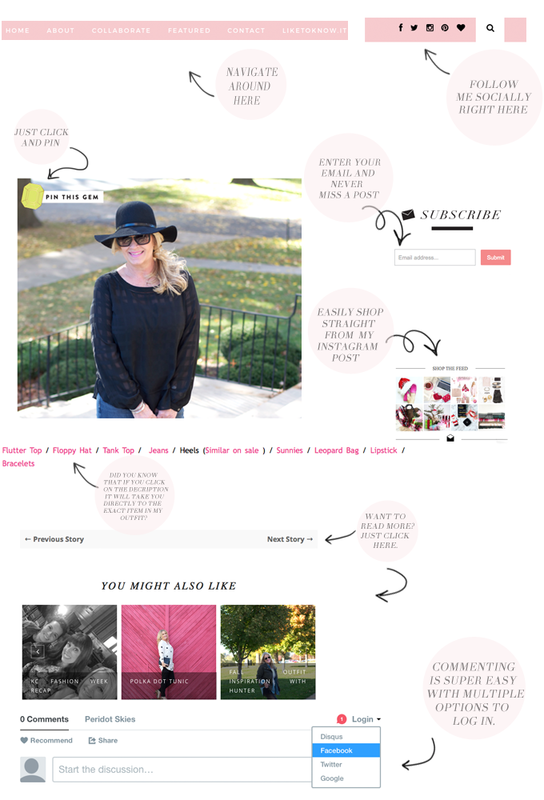 What better time to show you around then with my shiny new design too! The top pink bar is the navigation bar. This is where you will be able to return to the home page, learn about me and find out how we could work together. There is also a LiketoKnow.it link sharing everywhere I have featured on my instagram - both outfits and links. To the right of the navigation bar are all my social icons. Click on any icon coordinating with my social media and it will take you right to my instagram, twitter, Pinterest, etc. The little magnifying glass will open up a search bar for you to search for anything that has been on my blog. For example, type outfit into the search bar and every post I have labeled with this will show up for you to read. Now we move into the body of the post. There is a pretty little "pin this Gem" (the picture of the peridot), located on each image to help you save something you like to Pinterest. Here is a helpful bit of information that I am constantly asked about, under each post, whether it's an outfit or a favorites collage, there will be a list of the items listed out like I have shown. Sometimes it is the actual name of the item, ie: top / Hat / Jeans..... or other times it may be numbers that correspond with the favorites 1 / 2 / 3 etc. If you click on the item name or number it will take you straight to the item in the picture. Makes it pretty easy for you to find what I have shared, right? If the exact item is no longer available, I will try my best to link to a similar item and mention that in the description for you so you will know it is not exact. Under each post will be a bar giving you the option to read the previous story or the next post if this is not the newest post. There will also be a "You might also like" with images of posts that are similar to the current post you are reading. Click on one and catch up on some fun styles or ideas! Now let's move down the right sidebar. Remember earlier when I mentioned the sign up to receive posts straight to your email? Well, type your email address in this box and hit submit. You will receive an email verification. Once you do, you will need to follow the instructions to make sure you're not a robot and shazam.... a new post arrives via email every time I post. Maybe you saw something on my instagram and you want to know where to find it, click on my "shop the feed" and it will direct you to my LiketoKnowIt page. One of the newest features is pretty awesome - the new commenting form. So many times I received emails with comments because the old format didn't offer you good enough options to comment on the post itself. Good news is there are several options to log into the commenting form without having to jump through any hoops and you may now leave me all your comments right here! I can't wait to read what "nice" things you have to share and any questions you may have. I am looking forward to helping you as much as I possibly can with your questions and comments.